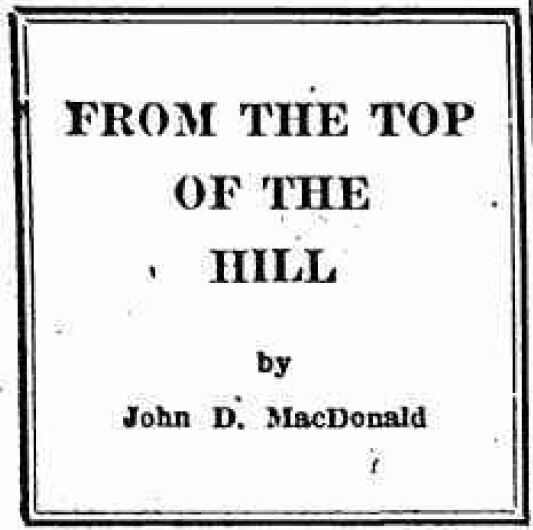 Here's another installment of From the Top of the Hill, John D MacDonald's newspaper column from the Clinton Courier. I've presented the last portion of this one before -- where JDM recounts the family's winter stay in Texas -- with additional background. If you're interested you can read it here. We'll call this section The Old World -- Glances Over the Shoulder at what was going on exactly ten years ago this week. President Roosevelt spent a rugged week talking to business men and politicians about the 37-38 industrial recession. Hirohito, Emperor of Japan, was pleased to call his reign the "era of radiant peace." Congresswoman Virginia Jenckes of Indiana proposed to the Washington DAR that the Capital's famed Japanese cherry grove be cut down and sawed up for firewood. The Japanese Second Army was consolidating its gains in Paoting, North China. In Moscow's Red Square Stalin reviewed 1,750,000 of the faithful and introduced his fifth grade, eleven year old daughter, Svetlana, to the public. Dr. Arthurs Holley Compton, physicist, obtained first empirical proof of the existence of a gimmick called a "neutrino." Three hundred and fifty railroad cars and locomotives were torch-cut into scrap near Memphis for shipment to Italy's war machine. We were enjoying Carole Lombard and Frederic March in Nothing Sacred. Remember that wonderful right cross to the Lombard chin? World news of ten years ago has a wry flavor. Thirty million people went blissfully about their business, unaware that the war would pop them into untimely graves. There were enough houses for everyone and five dollars would buy a grocery order that was work to carry out to the car. Let us know if you want this feature continued. Last winter we followed the sun to Texas. It was in the nature of a gamble, because the typewriter we took along had to bang out enough saleable wordage to get us back. We were looking for a place that wasn't expensive. Believe it or not, we found such a place and we herewith recommend it to all who wince at the thought of Florida tariffs. Go to the Hill Country, seventy miles northwest of San Antonio. It is a resort section used by the people from the Gulf cities when the summer heat down there becomes unbearable. During the winter it is pretty quiet and thus accommodations that, during the summer months, rent for two and three hundred a month can be obtained for fifty and sixty. And it is almost as warm as Florida. We stayed at a place called Bon Aire Lodge six miles from Ingram, Texas, "the only all rock town in the U.S.." They stamp that on outgoing letters. Bon Aire Lodge isn't a lodge. The proprietor purchased the mess hall from a P.W. camp, cut it into pieces and sprinkled the pieces around on a rocky hill. He paneled the inside in Mexican pine and had local stone masons rock the outside. We rented a cabin that had yet to be rocked. After we were there a week, a truck dropped great slabs of white and brown stone beside the cabin. A few days later some lean and dusty men showed up with chipping hammers and went to work. During the chill of early morning we furnished the coffee. The men talked to each other in a very normal fashion. "Mistuh Lee, would you kindly hand me that rock?' They has worked together for years and it was still on a mistuh basis. They sang while they worked. It was a song we'd never heard before. No words to it. A mournful chant, plaintive and haunting. We were sorry when the cabin was all rocked and they moved on. This summer, as the FM tower diagonally across the street from us was being built, we were walking near it. Suddenly he heard that same song. We found out the next day that the steelworkers who put up the tower came from Texas. Last night we looked at the red lights blinking on the tower and thought of that plaintive song. We thought of the live oaks, the hillside goats, the Guadalupe River. We remembered sitting out in the sun in a swim suit while we hacked at the typewriter during February, March and April. 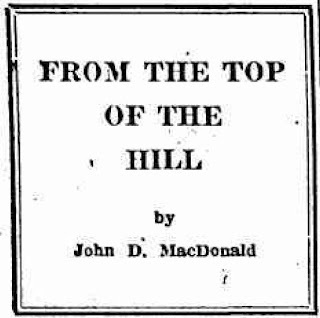 We remembered the big-hatted, slow-talking men gathering, with their weathered-looking women at the stone schoolhouse during the evening to play dominoes. If you get tired of ice and want to head down in that direction, let us know. We'll tell you whom to write to. That is, if you don't mind being envied.